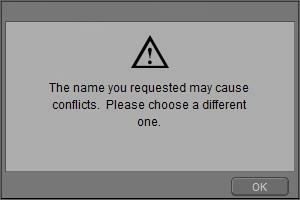 This is so frustrating when trying to save my work - why does Poser 11 have this message and can it be turned off? @tastiger I think you have "use external binary morph targets" checked. That is the only time I saw that warning with UEBMT checked. That's not it I get this message every now and then and I have this setting turned on. @ghostship I have turned them off so will see what happens - will report back. I misread. I thought you meant having it off caused it but I see you said having it on causes it. I will try turning mine off as well sorry,. It has to do with the scene having the same name as one of the figures or props which has a PMD attached. Poser may get confused if there are two files with the same name in the same scene. Load a a figure called MyGirl which is stored in the library (with an attached MyGirl.PMD) and the scene is called MMyGirl as well. If the scene is saved with external binaries on, it would have the same name. Just to add to this, you can have the same thing happen if you export a scene with collect inventory, even if use PMD is off. It does come back to what Wim mentioned as well. Many times I set up a scene on one machine that has all of the runtimes attached to Poser, save the scene locally, the export the entire scene to my render cow which does not have any of the runtimes attached. A name that works locally may not when exported due to PMD being used with the export script. I have had a problem with similar cause but crashing Poser 11 if a library file is loaded which includes a readScript line that references a file with the same basename (filename without the folder path) as one already being read. Presumably the internal file reading logic indexes open files by their basename, not by their unique path (obviously a file recursively reading itself would never end), so they try to prevent you creating file names which might incur that problem. Not that that fixes your issue, sorry. This is usually when I have the problem, what is the way to fix it? Is it turning off "use external binary morph targets"
No, the answer is simple: Give content files a "proper" and unique name. The worst examples are : "Readme" files. => LOL, how many of those do we have? LOL. Enough to confuse the Galaxy and beyond. LOL. No, when you load something common like a "bed", or a "chair", and the content path is not properly specified, Poser will start looking and searching your library's and load the first "bed" or "chair" it finds. => It will do the same for textures, and if a "wood" texture is not properly specified, or the content not properly installed, Poser will load the fist "wood" texture it finds in your library. Thanks for all the replies and answers. But sorry - I'm having problems trying to get my head why it happens when I am simply saving out the same scene (not "save as") instead of waiting for auto save to kick in (does that even work? I have had issues loading auto saved files and they seem incomplete) and I have changed nothing in that scene, except perhaps run a simulation, I end up having several copies of the same scene but with different names and honestly I can't remember having seen the error in earlier versions. Ah this problem always occurs when I use external binary morphs to save a scene, then switch that option off in preferences, and try to save with same scene name.